I don't sneak vegetables in my kids' food. One of the reasons you won't find any vegetables masqueraded in my meatloaf or disguised in the dinners I make is because I'm too lazy to go to the trouble to cook, puree and find ways to surreptitiously incorporate them into recipes. But most importantly, I want my kids knowing that vegetables ROCK and will help their little bodies grow everyday. You can read more about my thoughts on all this (and strategies to help make your kids great eaters) in my new book, but trust me, if you simply make good stuff for your children and tell them repeatedly enough that they're going to get bigger, stronger and smarter from that handful of bell peppers or broccoli, I bet that sooner or later they'll take it to heart and dig in! I watch Chloe do this everyday as she eats her veggies while acting out making big muscles, trying to surpass her big brother. I know first hand it's not easy, but the work and persistence pays off. 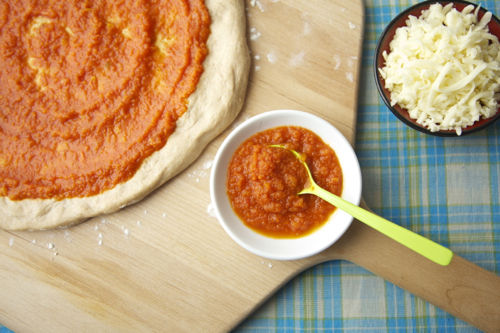 If you're the parent of a picky or challenging eater, this Veggie Heavy Pizza Sauce is for you. It's basically a variety of cooked and pureed vegetables, but it tastes just like the sauce you get in your favorite pizzeria. While it is right at home on top of a crisp pizza dough, it's also perfect on pasta, rice or even quinoa. I find it so versatile in fact, that I usually make a double batch and freeze what I don't need so I can easily reheat it for dinner next week. Or next month. So don't sneak! Tell your kids that not only is this is the most tangy, tasty sauce ever, it also happens to be entirely made from veggies! (O.K., tomatoes are actually a fruit, but that's a matter for another time.) Knowledge is power my friends, and I say that it also happens to be delicious! 1. Heat the oil in a saucepan over medium heat. Add the bell peppers, carrots, celery, onions and garlic. Saute until veggies are soft, about 5 minutes. Add the tomato paste and cook for 1 more minute, stirring constantly. 3. Add the tomatoes, reduce heat to low, and simmer for 10 minutes. 4. Remove from heat, puree with an immersion hand blender (or in a regular blender) until almost smooth. 5. Return sauce to the heat and simmer until thick, 10-20 minutes. The longer you simmer this sauce the thicker and more flavorful it will become. You can simmer up to 2 hours. Hi Catherine - is it really 1 Tbsp. tomato sauce, or should it be tomato paste? (That's what I'm more used to seeing). Thanks - looks good! I don't use celery but do add spinach to mine! I freeze surplus veggies from the garden all summer long, and at the end of season, pressure can big batches of all-purpose mixed veggie sauce to use on pasta, pizza, and more! It's so much yummier than plain old tomato sauce. Thank you so much--we need this for our son who refuses to eat a lot of vegetables. Could I add other veggies like spinach or zuchini or would that chage the texture/water content too much? Any combo of veggies will work, but you might need to adjust the length of simmering time to get it to the thickness you prefer. Hmm I think spinach would work, but you might need to simmer the sauce a little longer to get it to thicken and allow some of the liquid to evaporate! Making pizza tonight so I am going to give it a try! I'm wondering about the 1 Tbs tomato sauce also. Should it be paste? Also, I don't see where it is used in the recipe. Yes, tomato paste! Add it just after sautéing the veggies. I have updated the recipe! Thank you! Great idea. I also don't \"hide\" veggies, but one of my kids is sensitive to food textures, and pureed veggies work best for him. I actually use your \"roast vegetable pasta sauce\" as a pizza sauce. My 3 year old loves it and so do all of his play dates! I will give this a try and see if its just as popular! Julie, I also had a little one very sensitive to textures (projectile throw up of his entire meal when the texture of one thing was even slightly off of acceptable to him). He ate nearly only pureed food through age 2. I got a lot of judgment from strangers, friends, family. He's 4 now and he loves whole fruits and eats unpureed carrots, peas, snap peas, small bits of broccoli, etc. and even eats a few veggies raw. It feels like such a victory to just get here. He still gags on potatoes and other things, but now at least we have hope. I wish you the best with your little one as well, but things like this are so great in the meanwhile. Good luck! sriya, thanks for sharing your story! My son occasionally vomits after eating also. I get tons of judgmental stares and comments too. I am actually not sure if he has a texture issue or just a very small belly. I am so happy and hopeful to hear that your lil one eats raw fruit and veggies! Good luck to you! Veggies are open in plain view on the plate in our house, but also hidden in anything extra I can fit them into. My kids love their veggies and gobble them readily, but it totally cannot hurt for me to make meatloaf healthier with grated carrots, or taco meat beefed up with broccoli bits. I love my veg, too, including extra whenever I can get it. Loving this recipe. YUM! Last night my son continued to refuse his dinner while saying \"I just want to be small mommy. I just want to be tiny.\" He didn't want to eat his dinner and be strong! AHHH. I will keep trying. Oh, this sounds like a great recipe for wee ones and grown-up kids too! I love all the veggies you snuck in - perfect for any age! I've had a hankerin' for pizza. Plus my surplus tomato supply would make some pretty terrific sauce! Just made this....turend out great! I plan to use tonight as pasta sauce, not pizza. Is it ok if it simmers longer than 2 hours, like 4? I worked from home today, but also snuck in some cooking. Not eating for 4 more hours. Also making broccoli salad for lunches. It should be fine to simmer for 4 hours! Just make sure it is at a low simmer so it doesn't burn or anything! This looks delicious. I wonder about the yield- four cups seems like a lot when pizza muffins and pizza balls call for just half a cup each. Unless it's meant to be a fridge staple- How long will it stay good for in the fridge? Thanks! I was able to make 2 large pizzas with this sauce! It will keep in the fridge for about 5 days, and in the freezer for about 2 months! can i use tomatoes instead of canned tomatoes, if so how many will i need? Yes! About 6 cups of diced tomatoes! I'm all for veggies in sauce. I shred all kinds of stuff into my sauce and just purée it afterwards. As far as meatloaf and veggies, I put veggies in there but I don't technically hide them. I drain a can of petite dice tomatoes, shred a couple of carrots, or I add a thawed and drained (very well) box of chopped spinach. And here I thought I was the only one who did that! :-) My 15 month old loves it when mommy makes \"pizza\". I use a pita bread and make a veggie sauce and top with cheese and sometimes bacon or homemade pork sausage or something. He loves it! Great minds think alike I guess. Excited anout joining need try these recipes. I just made this... not for a toddler though! It's baking as I type and it smells AMAZING! So easy, which is key for a beginner like me. Thanks for the great recipe! Excellent recipe. I've made this twice for my 5 and 2 year old and they love it. I portion it into small mason jars and freeze it for a couple of months. My wife and I began a 30 day challenge to ourselves to eat vegan. This is an awesome recipe! Great for pizza sauce, add some tomato juice to thin it to a tomato soup, or use a 28 ounce can of fire roasted tomatoes and one of the regular diced for a spicy marinara for spaghetti! Can I freeze this recipe?? Just did it and added a little salt and it's delicious! I like the veggie heavy pizza sauce. How long can I use the sauce if left in my fridge? It will keep in the fridge for about 1 week. You can also freeze it for up to 4 months!